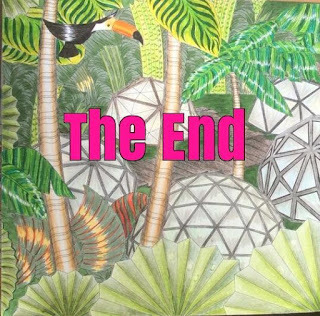 Recently I finished colouring through completely, my first book. I certainly learnt a few things along the way and I thought I'd share these tips with you. Others who are colouring a book right through gave their tips too, so here is the combined result. 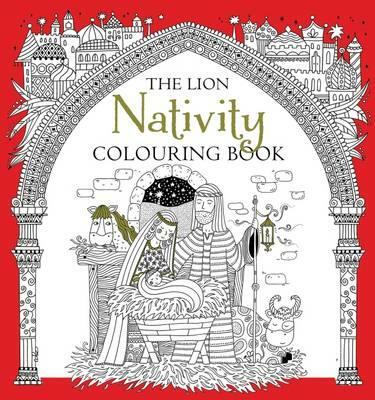 Before you start colouring, take an hour or so and read right through your chosen book. If there's a text or story running through it, get familiar with it. If you chosen book is based on a known work of fiction, you might like to reread the original. Have a good look at the drawings too. Are there several wallpaper spreads? These are spreads that contain repeated motifs. They require a bit of planning and thought to make them interesting for you to colour and for people to view. 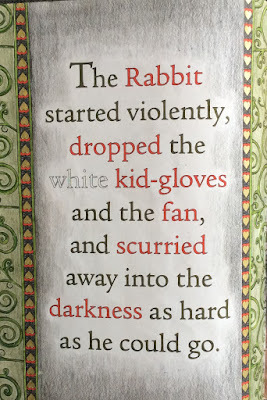 If your book contains text that you can colour in, have a good think about how you're going to approach this before you colour your first text page. Are you going to colour all the text on a page in the same colour? That's fairly straightforward. Maybe you want to bring out the important words in the text? Try saying the text out loud to yourself and identify these important words. You will need to colour these words in a stronger colour than the rest of the text or they will not be so obvious. 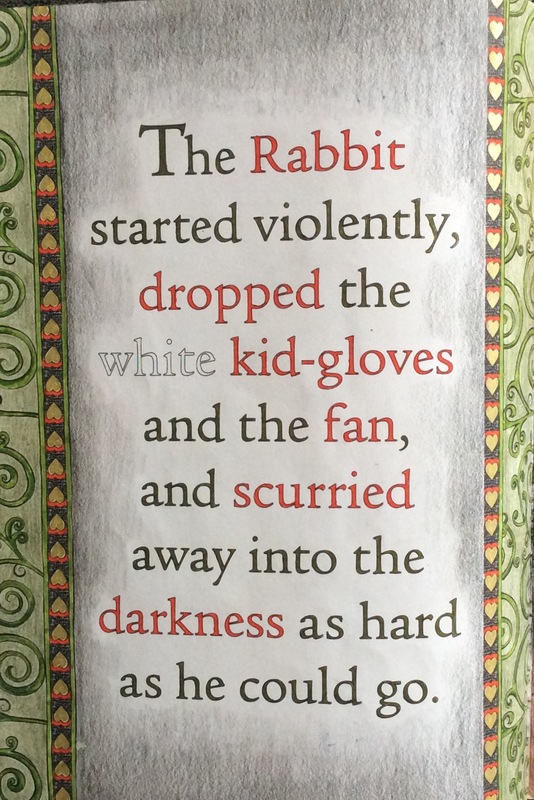 Here is a text page that I coloured from Alice. You can see how the accented words are the important words in the phrase. These are only temporary coverings to protect the cover as you colour. Believe me, as you colour through the book you will be very glad that you did this before starting! I learnt this lesson the hard way when my book cover became messy with pastel dust and pencil marks. I covered my Alice book with some brown paper which was really sturdy and lasted the distance. 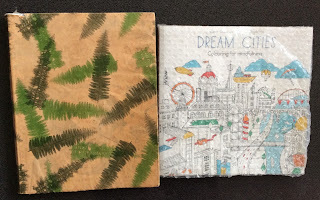 For my Dream Cities book I just used some bubble wrap, which is okay too. If your book has images on single-sided pages, this won't be a problem. However if your book has double-sided images, take note! If you want to avoid bleed through, which is normally the case with alcohol based pens, then you need to look at using water-based pens. Before you start, take quite a dark colour and test it on an unobtrusive place in the book. You'll be able to judge if there's any shadowing come through the the other side of the page. Often with water-based pens you need to use a light touch. If you keep going over a patch, then you'll probably get shadowing through to the next page. This happened to me a few times colouring Alice and that meant I had to get a bit creative when I coloured the next page. Test your fine liners too. If you are colouring the same character repeatedly through the book, keep a note of the colours you use so that you can be consistent. Also if I was colouring some skin tone for example, I'd work ahead a few pages just doing skin tones, or Alice dresses. Now you're ready to start. 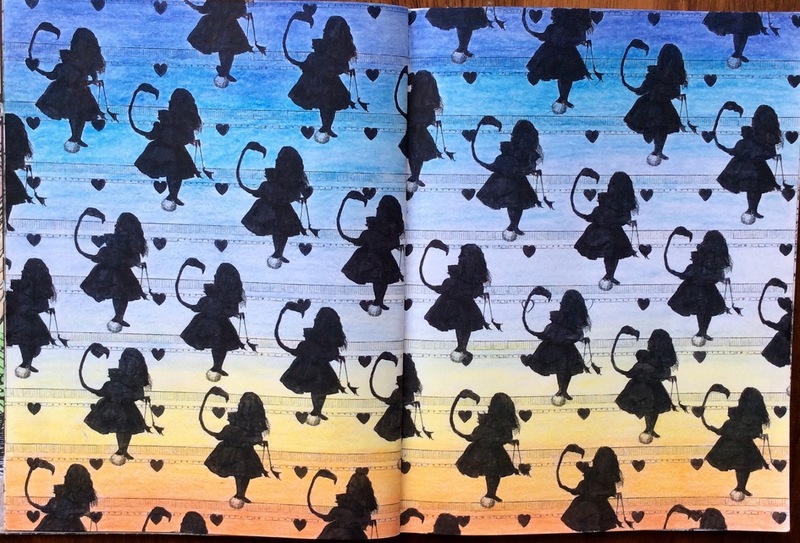 Are you going to colour the book in sequence, page by page? We'd highly recommend that you do this. Perhaps you could leave the title page until last, but otherwise, start at the first spread. What if there are pages you don't like much? Of course there are always going to be pages you're not particularly fond of. Look on this as a challenge. What can you do to bring this page to life? Think about it in the middle of the night when you can't get back to sleep! My best thinking time! 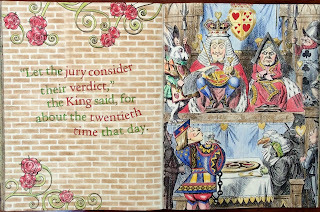 By colouring the book in sequence you will get a real sense of progression through the book and you'll appreciate more how the book has been arranged to be a coherent whole. This is especially important if the book is telling a story. Artists and publishers usually give some thought to this aspect. Think about picking up a child's picture book to read. You'll notice how the illustrator follows a page of bright colours with a more subdued page. 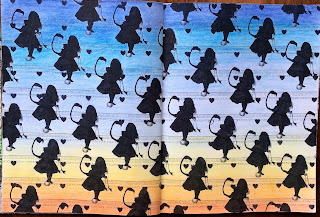 Maybe try doing a spread in sepia colours, or monochrome or even in silhouette with a bright pastel background. Or maybe add in a black background to make your colours "pop". Perhaps you feel confident to add in some of your own embellishments. I'm not in that league, but I do enjoy using stencils with pastels to give a textured background look. So pace the range of colouring styles through your book. You'll learn a lot by doing this and it'll make the project more interesting for you. Also you might like to join in a Facebook group challenge for one of your spreads. This is where Facebook comes into play. It has been a wonderful vehicle for colourers to share what they are doing and we've all learnt so much from the many colouring groups out there. So join a Facebook group to share your colouring. Just last weekend I set up a specific group called Colouring the Whole Book. It's a lovely, tiny little group that is active already. That's how I want it to stay - small and active. But if you are colouring through an entire book and you'd like encouragement and a chance to share, please do a search and join the group. 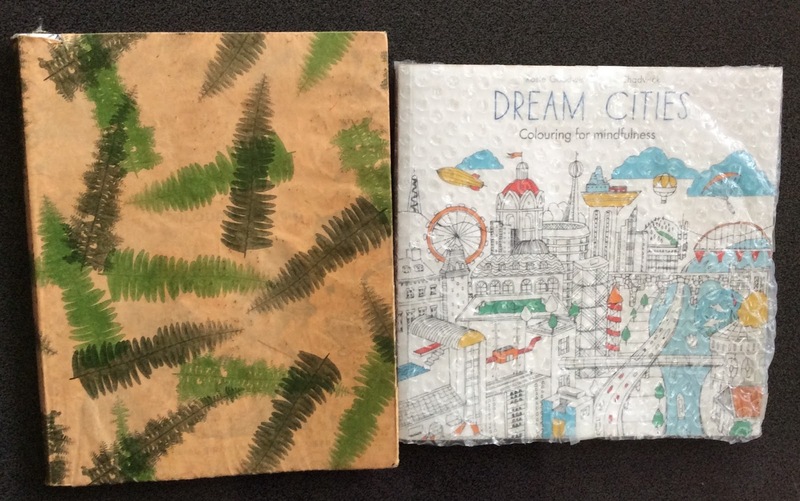 From time to time you may feel a bit overwhelmed, or just plain bored, with your project so take a break and colour a few postcards or images in other books. When the time's right, you'll be drawn back into your project, with renewed enthusiasm. Finally - how about making a video flip through of your book, maybe when you've coloured a quarter way, halfway, three quarters way and eventually completed the whole book. I promise you, you'll get a huge buzz from this. 19 Must See New Books for October - here. 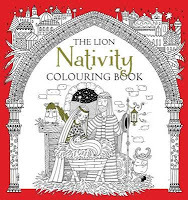 Celebrate & Colour the Nativity - here.